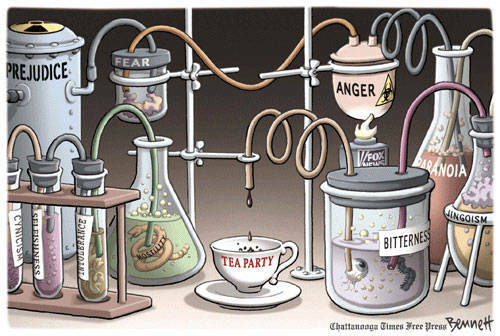 What’s brewing with Tea Party Jurors? Home/The Jury Box (Edward P. Schwartz)/What’s brewing with Tea Party Jurors? Back in the fall, I was running focus group research in an undisclosed location, in preparation for an undisclosed case, scheduled for an undisclosed trial date. (See how I did that? I just made my completely mundane case seem much more interesting by refusing to tell you anything about it.) Truth be told, the case details are irrelevant for the purposes of this post, except for the fact that it involves a consumer protection dispute. I always have my focus group participants complete an extensive written questionnaire before the study begins. Think of the supplemental juror questionnaire (SJQ) you’d use if you were arguing your case before a really enlightened, curious and slightly whimsical judge. It’s kind of like that. The general information section contains pretty standard stuff about occupation and home ownership, mixed in with the usual pot porri of inquiries about tattoos and home schooling. As I was finishing up the questions for this section, I noticed I had some white space before the next section on “Experience with the Legal System,” so I decided to add another question. “What do you think of the Tea Party Movement?” Mostly, I was curious about what people would be willing to write down about something that had engendered so much anger, confusion, frustration and passion in the general public. I consider myself a pretty astute student of politics. I did teach in the Government Department at Harvard for ten years. I watch the Daily Show every night. I have RealPolitics.com bookmarked on my browser. But I have to admit that the Tea Party Movement has me stumped. It is easy to be really cynical about this group, blanketing them with a categorical label of “Angry Whackos.” Such a characterization, however, would be dismissive of the very real appeal that the movement has for a lot of people. There has to be a “there” there; or, at least something that actually unites the people who identify themselves as Tea Party supporters. From a professional perspective, it is even more important for us to get a handle on what is driving the decision-making of Tea Party sympathizers. Tea Partiers are active in politics. They register to vote and go to rallies, so we should expect them to show up for jury duty when summoned. This begs the question: What will Tea Partiers do in the jury box? On the surface, a typical tea party juror looks pretty good for the defense. They tend to believe in personal responsibility. They are more likely than your average respondent to think that there is a torts crisis and that frivolous law suits pose a real problem. Tea Partiers object to many entitlement programs and believe that too many Americans expect a free hand-out at every turn. At our study in October, we had one such participant. Let’s call her Sally (not her real name). In response to the Tea Party question, Sally had written, “Actually, I think they’re great!” During an early part of the study, when I had the moderator pose hypothetical scenarios to the group, to see how they perceived situations similar to what we faced at trial, Sally rolled her eyes at one point, saying, “Oh, she’ll probably pick up the phone and call her lawyer. That’s what’s wrong with America. Everyone immediately thinks about suing somebody when anything goes wrong.” At this point, Sally sure seemed like a good defense juror. The problem with the Tea Party paradigm, however, is its profound inconsistency and hypocrisy. What seems to unite Tea Party supporters is a profound lack of empathy for people unlike themselves, along with an almost hysterical need to have their own grievances heard and attended to. As such, when contemplating a Tea Party supporter as a juror, it is absolutely critical to gather a great deal of information about that person’s life to make sure that your case doesn’t push any of their hot buttons. Turns out Sally had a hot button. WIthout giving away too much about the case, let’s say that it involves a relatively minor nuisance which the federal government had seen fit to penalize with extremely high mandatory civil penalties. As such, a thriving cottage industry has popped up of attorneys whose entire practice is to cobble together plaintiffs and sue under this one statute. After spending hours bemoaning the litigiousness of American society, Sally and her fellow respondents were finally introduced to the facts of our little case. Well, wouldn’t you know it, Sally had actually experienced the same problem as the plaintiffs in our case. Ironically, Sally had hired one of the companies who had inconvenienced her in violation of the statute and had been quite pleased with their work. Despite her prior rantings against suing in similar circumstances, and chiding from fellow respondents about the inconsistency of her position, Sally wanted to hang the defendants by their thumbs and drive them out of business. Sally constructed an entire fantasy about exactly how the defendant company operated, in order to justify her position that they, unlike the companies in the hypotheticals she had just finished discussing, deserved the most punitive treatment available. Normally, this kind of argument would hold little sway with other jurors. The problem we faced in this case is that no-one else on the panel had any personal experience with the circumstances surrounding the case. So, while most subjects could easily dismiss Sally’s arguments as convoluted, several were willing to defer to her on the grounds that she had relevant experience they did not. That is, Sally was a self-professed expert and that was enough for them. Just this past month, I ran a multi-panel focus group study for a case involving one of Boston’s many universities. Again, without going into details about the case, I will divulge that the main witness for the defense was a very smart professor at the university. What makes this case potentially problematic, from a defense perspective, is that it is quite complicated and involves inner workings of a university with which most jurors will be quite unfamiliar. As such, the defense team wanted to make sure it could do a good job of getting jurors to actually understand how things work and who has responsibility for what. We presented our treatment to the respondents and were pleased to see that, for the most part, they “got it.” That is, we had done a good job of conveying a lot of esoteric and complicated information in a way that ordinary people could understand. As it turned out, however, we weren’t out of the woods. There were two respondents who had decided that the university was not only wrong, but also evil and malicious. One of them wanted the university officials to be criminally prosecuted. Reviewing their initial questionnaires, I didn’t find any real red flags. They both have degrees from local colleges, although not particularly good ones. One is a payroll manager and the other is a “self-employed” ticket broker and “public speaker.” The payroll manager, however, answered the Tea Party question, “They have some important ideas.” I decided to dig a little deeper. Both of these respondents listed Fox News as a major source for news coverage. They also both read The Herald, and not The Globe. In addition, our ticket broker is from Revere and the payroll manager is from Winthrop. These are two blue-collar, mostly white, communities north of Boston. They are also the only two towns in Suffolk County that went for Scott Brown in his Senatorial contest with MA Attorney General Martha Coakley. While Ms. Coakley won 70% of the vote in Boston, she won 46% and 44% in Revere and Winthrop, respectively. Confirming Senator Brown’s appeal among blue-collar white voters, the only parts of Boston he won were South Boston, West Roxbury and the majority white neighborhoods of Dorchester. One mainstay of the Tea Party movement and the Fox News propaganda is a rabid anti-intellectualism. They regularly vilify East Coast Liberal Elites and preach adherence to faith over science. Followers of this dogma are trained to be inherently suspicious of major research universities. Such universities are the homes of those perpetrating the global warming hoax and foisting evolution on unsuspecting school children who should be taught only creationism. In short, a professor at a major Boston university is immediately and automatically suspect, regardless of what he or she has to say. In addition to asking about preferred sources for news, I ask respondents to tell me about social media usage. Our ticket broker has a Twitter account. He doesn’t tweet much, but he did post extremely religious messages on Christmas. He follows both Scott Brown and Fox News on Twitter. In short, he is a Christian Conservative living within a stone’s throw of Boston. There were fewer overt signs of political preference for our payroll manager. I did, however, pull up her LinkedIn profile. After many years at the same company, she changed jobs last June. She lasted only six months at the new company and only found work at a third firm after a few months without a job. While we will never know exactly what happened that caused her to leave her new job after such a short stint, it is not hard to imagine that she had some sort of negative experience working there. Because Tea Party sympathizers weight so heavily their own experiences and concerns, her extreme negative reaction to our case might have been triggered by her own lingering hostility towards her last employer. They are a big corporation and a university is a big corporation. Our ticket broker is obviously struggling to make ends meet. He has a college degree and thinks of himself as very intelligent and articulate. He would raise his voice to be heard and was the one participant who regularly cut people off or spoke over them. He had all the characteristics of an inferiority complex and could reliably be counted on to disparage the testimony of some fancy-pants professor. If you practice in a jurisdiction with real attorney-conducted voir dire and/or regular use of supplemental juror questionnaires, you can probably tease out the tea party supporters. You can ask them questions about their experiences and make sure they have no negative associations with the topic of your case. Life is much trickier in a jurisdiction with limited voir dire. Standard practice in Massachusetts, for example, is for the judge to ask all the questions, with limited input on question content from the attorneys. The main round of questioning is done as a group in open court, so all of the questions must be phrased to accommodate yes or no answers. The judge decides how deeply to dig into any topics at sidebar for any subsequent individualized voir dire and the lawyers are not permitted to speak directly to any of the prospective jurors. One byproduct of this arrangement is that judges typically ask extremely direct and pointed questions, but not ones that a student of juror psychology would suggest. A Massachusetts judge would never ask a prospective juror about her views on the Tea Party unless the case were specifically about something a Tea Party leader had done. So, in a world of limited voir dire, it is very difficult to explore these tracers for attitudinal tendencies. And, without attorney-conducted voir dire, it is pretty much impossible to get information about attitudes directly. In short, we’re screwed. In the case involving the local university, we will try to use the demographic information to our advantage. We will keep an eye out for blue collar, white jurors, without major university credentials, from pro-Scott Brown communities. This is, unfortunately, a third-order proxy for what we really want to know about these people, but it is the best we can do in such a low information environment. My main advice for anyone facing the prospect of Tea Party followers in the jury pool is to be extremely careful to identify them and gather as much information as possible. My experience is that such individuals can be unpredictable and capricious. Equally important, they like to talk and believe that what they have to say is profoundly important. One characteristic that seems to be shared by many Tea Party adherents is sense that their voice is not being heard by those in power. They are loud, persistent and desperate to be heard. As such, you must anticipate that a tea party juror will be an active juror, a persistent juror, and an incalcitrant juror. You had better know in advance exactly what they want and what their hot button issues are. If you don’t I recommend that you burn a peremptory strike and move along to the next person in the box.